You've been to cooking parties, jewelry parties, and even perhaps tupperware parties! 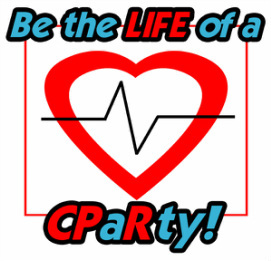 Consider hosting a CPaRty for your friends, family or small business. We bring everything to you. All you do is have fun, and learn some life saving skills. A CPaRty is not a certification class. No books, no videos, and no lectures. You and your guests enjoy a few hours of food and drink, and can wander into an area of the room that we set up for the CPaRty. One of our certified CPR and first aid instructors will train your guests on CPR, choking and other first aid skills. No stress, just fun! CPaRties are perfect for holiday parties, birthday parties, dinner parties or casual brunch get-togethers. The possibilities are endless. The skills are invaluable. We bring the training equipment and practice game - have fun and compete with other guests for great prizes. For more information about pricing, options or scheduling a CPaRty please complete the Inquiry Form, or call us at 914-266-0559.